suppurative diseases of the respiratory system: bronchiectasis, pneumonia, lung abscess, atelectasis, exudative pleurisy, empyema, bronchitis. 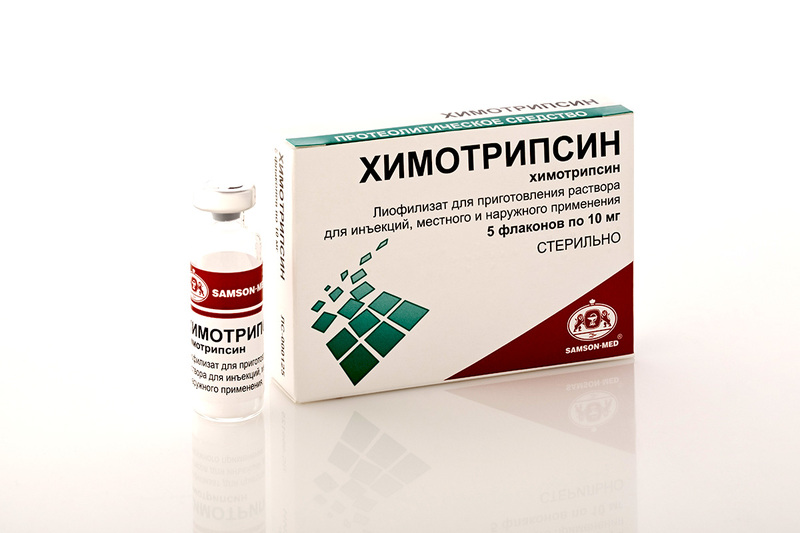 hypersensitivity, malignant neoplasms, pulmonary tuberculosis (open form), chronic heart failure II – III degree, degeneration and cirrhosis of the liver, viral hepatitis, pancreatitis, hemorrhagic diathesis, pulmonary emphysema, respiratory failure. It should not be injected into the bleeding cavities, neither applied to the ulcerated surfaces of malignant tumours in order to avoid the spread of the malignant process. intramuscularly in doses of 5-10 mg per day for 10-12 days, may be combined with the use of chymotrypsin aerosol in 5% aqueous solution in an amount of 3-4 ml. After 7-10 days, the treatment can be repeated. The required amount of the drug is dissolved before injection in 1-2 ml of 0.9% sodium chloride solution for injection or 0.5-2% procaine solution.